If you really believe Jesus still heal and deliver His people from destruction then you owe it to yourself to read this book and make the change. It can happen today! There are times in your walk with God when brokenness and despair will feel like a wind storm that will never end. Having something extra is a plus to encourage and strengthen your worship and praise. Once engraft in your spirit through meditation the power of healing will manifest an attitude not to turn back. Take the awesome journey with these prophetic affirmations and read how God can heal, deliver and set free from feeling, Alone, Discourage, Fear and Despair. If your spirit is ready for a new beginning get ready position yourself for a new harvest as David the Well Dressed, Well Blessed, skillful warrior did encouraging himself in the Lord. Having this book will be a reminder how you can claim God's future. Read and let it happen now. 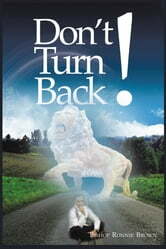 Books related to Don't Turn Back! Help Me, I've Fallen and I Can't Get Up! So You Call Yourself a Man? What Has Separated Your Heart? Find It Again. Today Is No Ordinary Day! No More Mourning, It's Time To Travail! Now You See Me...Now You Don't!